A truly authentic camping safaris in the famous game rich Serengeti, Tarangire and Ngorongoro Crater National Parks. With adventure in abundance, you’ll sleep in tents, complete with mattress and sleeping bags, under the stars. This itinerary can also be customized to meet your preferred accommodation. For safaris in June we tour Lake Manyara instead of Tarangire National Park. After breakfast at your hotel, you will be driven to Tarangire National Park for your first game drive. The park’s natural vegetation mainly consists of Acacia woodland and giant African Baobab trees. The animal population here rivals that of the Serengeti so on your game drive you will have the chance to see large herds of elephants, wildebeests, zebras, elands, hartebeests, buffalos, gerenuks, fringe-eared oryx, and flocks of birds of many different species. 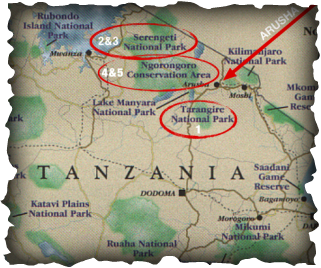 Today we depart in the morning and drive through the small town of Karatu, Ngorongoro Conservation Area and the Southern Serengeti before reaching Serengeti National Park. The name comes from the maasai 'Siringet', meaning endless plains. One of the world's last great wildlife refuges, various types of vegetation: grassy plains, savannah with acacias, wooded hills and mountains are the backdrop for an extraordinary concentration of animals which reaches its peak during the wildebeest migration. In the afternoon we begin our game drive in the Serengeti. Here you will see wildebeests, buffalos, hippopotami, elephants, zebras, hyenas, cheetahs, leopards, lions, giraffes, impalas and topis. The Serengeti has also more than 500 bird species. Today we have a full day in Serengeti where you have choice of morning and afternoon game drives with lunch and rest at our campsite, or a full day with packed lunches. We wake up early for our final game drive in the Serengeti and return to camp for breakfast. We then drive to the stunning Ngorongoro Conservation Area with a picnic lunch. This area is located in the Great Rift Valley and volcanoes, mountains, plains, lakes, forests and archeological sites form this mangnificent landscape. From here you have the option to visit Olduvai Gorge "The Cradle of Mankind" – where Dr. Louis Leakey discovered the first fossils of hominids that walked upright. After breakfast, we drive on the crater rim and down the descent road some 600 meter below. The Crater’s resident wildlife includes some of the last remaining black rhinos in Africa, buffalos, lions, hyenas, jackals, cheetahs, and leopards. We spend several hours viewing wildlife on the Crater floor before your drive back to Arusha for your overnight stay. Let us know if you would like to add Zanzibar as your next destination. Sun yourself on Zanzibar’s beaches, explore the spice tours and famous stone town.